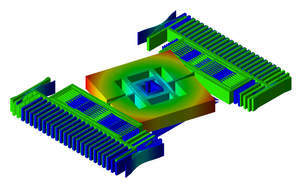 October 05, 2015 09:00 ET | Source: Coventor, Inc.
Visualization of 3-axis MEMS gyro, courtesy of Murata Oy, simulated with Coventor MEMS+ model in MATLAB. CARY, NC--(Marketwired - Oct 5, 2015) - Coventor®, Inc., the leading supplier of MEMS design automation solutions, today announced the immediate availability of MEMS+® 6.0, the latest version of its industry-leading MEMS design platform. MEMS+ 6.0 is a significant advance toward a MEMS design automation flow that complements the well-established CMOS design flow, enabling faster integration of MEMS with electronics and packaging. MEMS+ 6.0 features new enablement of MEMS process design kits (PDKs) and second-generation model reduction capabilities. "The fast growing Internet of Things market will increasingly require customization of MEMS sensors and customized package-level integration to achieve lower power, higher performance, smaller form factors, and lower costs," said Dr. Stephen R. Breit, Vice President of Engineering at Coventor. "MEMS+6.0 is focused on enabling rapid customization and integration of MEMS while enforcing design rules and technology constraints." With MEMS+ 6.0, users can create a technology-defined component library that imposes technology constraints and design rules during design entry, resulting in a "correct-by-construction" methodology. This new approach reduces design errors and enables MEMS foundries to offer MEMS Process Design Kits (PDKs) to fabless MEMS designers. Both parties will benefit, with submitted designs having fewer errors, and ultimately fewer design spins and fab cycles required to bring new and derivative products to market. "We have collaborated with Coventor in defining the requirements for MEMS PDKs for MEMS+," said Joerg Doblaski, Director of Design Support at X-FAB Semiconductor Foundries. "We see the new capabilities in MEMS+ 6.0 as a big step toward a robust MEMS design automation flow that will reduce time to market for fabless MEMS developers and their foundry partners." MEMS+6.0 also includes a second-generation model reduction capability with export to MathWorks Simulink® as well as the Verilog-A format. The resulting reduced-order models (ROMs) simulate nearly as fast as simple hand-crafted models, but are far more accurate. This enables system and IC designers to include accurate, non-linear MEMS device models in their system- and circuit-level simulations. For the second generation, Coventor has greatly simplified the inputs for model reduction and automatically includes the key dynamic and electrostatic non-linear effects present in capacitive motion sensors such as accelerometers and gyroscopes. ROMs can be provided to partners without revealing critical design IP. Support for design hierarchy, encouraging time-saving re-use of device sub-structures. Refined support for including packaging effects in thermal stability analysis of sensors, reducing the impact ambient temperature can have on the thermal stability of sensor outputs such as zero offset in accelerometers and drift bias in gyros. Improved modeling of devices that rely on piezo-electric effects for sensing. Interest in piezo sensing is growing because the underlying process technology for piezo materials has matured and the potential benefits over capacitive sensing, the current market champion. An expanded MATLAB scripting interface that now allows design entry as well as simulation control. The MEMS+ 6.0 software is shipping now. For more detailed product information and to download the new software release, users can visit: http://www.coventor.com/support/portal/. Coventor, Inc. is the market leader in automated design solutions for MEMS and virtual fabrication of MEMS and semiconductor technologies. Coventor serves a worldwide customer base of integrated device manufacturers, fabless design houses, independent foundries, and R&D organizations. Its customers include developers of MEMS and semiconductor components and subsystems for the consumer electronics, automotive, aerospace, industrial, and defense markets. Components developed with our software are used in mobile phones, tablets, Internet of Things (IoT) devices, cars, and many other applications. Coventor's software tools and expertise enable its customers to simulate and optimize semiconductor and MEMS fabrications processes and device designs before committing to time-consuming and costly silicon learning cycles. The company is headquartered in Cary, North Carolina and has offices in California's Silicon Valley, Waltham, Massachusetts, and Paris, France. More information is available at http://www.coventor.com. Coventor and SEMulator3D are registered trademarks of Coventor, Inc. All other trademarks are the property of their respective owners. Note to Editors: Digital images are available.